I am interested in adopting a cat/dog I have seen on your site. What are my next steps? Is Zani’s Furry Friends ZFF, Inc in compliance with New York State Department of Agriculture and Markets regulations? Where is your organization located & where are your cats and dogs? I don’t live in NYC. Can I still adopt from ZFF? I’m still searching for but don’t see a cat/dog who is the right one for me. Can you help? I’m curious, why is your organization called Zani’s Furry Friends ZFF? I can’t make a long-term commitment to a cat/dog right now. Do you need fosters? I’m not able to have a cat/dog at the moment, but I would really like to help your organization. How can I help? Why do you rescue internationally rather than locally? What are the adoption donations for a cat or kitten? Can I adopt a solo cat? I specifically want a declawed cat. Do you have any available? What are the adoption donations for a dog or puppy? Do you require dogs to be adopted to homes with other dogs? Adopters are asked to complete either a cat adoption application or dog adoption application and spend time with their prospective companion animals. All adopters are carefully screened via vet and personal references, and a home visit is conducted. A tax deductible donation in an amount agreeable to all parties is requested to help defray our expenses (medical, transport, training, boarding, pet supplies, etc). Zani’s Furry Friends ZFF, Inc is a 501(c)3 organization committed to rescuing companion animals from New York City’s shelters where, unfortunately, they are at significant risk for euthanasia due to overcrowding. Our rescue efforts have expanded to the international arena where cats and dogs considered ‘pests’ are cruelly mistreated and exterminated often by government sanction. We rescue kittens and puppies as well as adult and senior dogs and cats who deserve another chance for a loving home. We do not have a shelter or boarding facility per se, but instead rely upon foster homes to shelter and nurture our furry friends until a loving forever home is found. Our foster network is located throughout NYC and sometimes out of state. The beauty of a foster system is that we know our animals individually and can give you a true picture of their personalities and ensure we make a good match for your family. We also work with rescue organizations internationally. 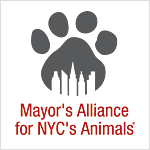 Our animals are mostly rescued from the NYC shelter system and our foster network is also located in the NYC area. However, we do cover the NY Tri-State Area, Southern NE, and occasionally will consider an adoption further away to the purrfect furever family! Please look at our list of adoptables, and if you don’t find one that seems right for you, or if you see one that is already flagged as adopted or adoption pending, please contact us at info@zanisfurryfriends.org to let us know what you are looking for, perhaps we can help find the purrfect match. We continually rescue new animals from NYC shelters and internationally on an almost daily basis and will keep in mind specific requests from good homes. Zani was the heart and soul dog of the founder of this group, a wonderful parti-colored Cocker Spaniel who crossed the Rainbow Bridge after a struggle with bone cancer. The creation and work of this rescue organization was our founder’s way of honoring this incredible dog who touched her life so deeply. Zani’s spirit is with us in every rescue we do and every animal we help. We are always in need of additional foster homes for either dogs or cats so that we may help free more animals from a dark fate at the shelter. Unfortunately our city’s shelters face a continual space problem, and dozens of healthy, adoptable animals lose the race of time daily. Our immigrants need patient homes to help them acclimate from very different circumstances in their home countries. If you are interested in opening your home and heart to foster one or more of our rescue animals please fill out a DOG FOSTER or CAT FOSTER application form. We are a 501(c)3 nonprofit organization, and are always in need of donations. That donation can be in the form of healthy treats, quality pet food, crates, blankets, new leashes and collars, toys, gift certificates to pet supply stores, kitty litter, etc. check out our Amazon CAT WISHLIST and DOG WISHLIST for all the items we are most in need of- all are gratefully accepted! We always need volunteers! If you have time available you may be able to help at activities such as adoption events, help with transportation or PR – please fill out a volunteer application. Please see our how you can help page for more information. We started out rescuing exclusively from NYC shelters as our hearts were with the local boroughbreds. As the ACC grew so did their donors. Today, the ACC’s numbers with the help of their donors have drastically increased the number of adoptions and decreased the number of animals on “euth lists.” We still pull cats and litters from the ACC regularly, as they are in most need of help. We also work with local shelters to assist with animals that end up in unfortunate circumstances – whether victims of divorce, eviction or, most sadly, terminal illness of the owner. Adoption donations are $150 and up per cat/kitten depending on breed/age/health/temperament and origin; special needs and seniors are less; pairs of kittens generally $300-$500 unless they are exotic breeds. Our cats from overseas (ie, Egypt, Kuwait, Russia) are $500 in order to cover transport and quarantine costs. Adoption donation includes spay/neuter, vaccinations, rabies, microchip and feline leukemia/aids combo test. Young kittens (under 1 year) must be adopted in pairs or to homes with another young playful cat or kitten to ensure the companionship and socialization they require – READ MORE. Adopters interested in adolescent or adult cats who enjoy cat company are encouraged to either adopt in pairs unless they have a cat friendly resident cat. However, sometimes our cats may be adopted solo if appropriate and this is usually indicated in their bio. While we do neither encourage, condone or purrmit declawing, we often rescue cats from New York City’s shelters who have already been declawed by previous owners. If declawed, their name is followed by a “D” and we will make this clear in their bio. Adoption donations are generally $350 and up per dog/puppy depending on breed/age/health/temperament and origin; special needs and seniors are less. Dogs from overseas (ie, Egypt, Jordan, Kuwait, Qatar, Russia, Nepal or the PR) are $500 and up in order to cover the cost of transport and quarantine. Adoption donation includes spay/neuter, vaccinations, rabies, microchip, and heartworm test (and we recommend Lyme vaccination once here). This may depend on the age and personality of the dog. Please consider providing a home for more than one dog, especially if you are considering adopting a puppy. Dogs are pack animals and very much enjoy as well as need other dog company to learn to play, socialize and be good companion animals to people. The upside to this is that you won’t feel as guilty leaving them alone and you get twice the love!